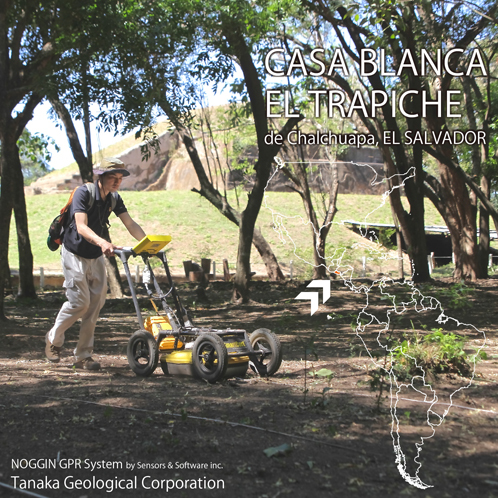 Archeology GPR investigation was conducted at two of the Chalchuapa ruins in El Salvador for ten days. Central America is one of the most important ancient civilization area in the world which the Mayan civilization is believed to exist. Noggin250 SmartCart system manufactured by Sensors & Software Inc. was employed. This system is a tough and hardworking GPR. It can keep collecting accuracy data even in a dusty environment of dry season. Also there have been no trouble nor breakdown with this precision equipment for over a decade. The Noggin system; we have been getting over a lot of difficult fields with this, and it provided us better-than-expected results this time, too. The products of Sensors & Software, which is one of the well-established GPR manufactures, have been having a highly confidence by researchers in Universities or governmental research institutes in Japan as it can provide them satisfactory data and results. We are looking forward to presenting the survey results to you at an appropriate time.